If you’re like most people, you don’t even think about your sinuses until something goes wrong. 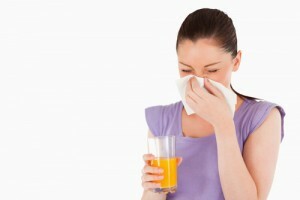 Clogged sinuses can lead to sinusitis, which causes pain and makes a tough cold or flu all the more excruciating. Many hope to treat their sinuses with medications, but there may be an even simpler solution – and it involves your diet. The things you eat can have a dramatic effect on those tiny passageways in our skulls. So how do you keep your sinuses healthy with meals? Try the best food for sinuses! Avoid foods that produce mucous and dampness: dairy products, cold and raw foods, corn (including corn syrup), and simple sugars. Choose whole grains like quinoa, amaranth and brown rice instead of wheat, rye and barley, which are typically high allergy grains. Opt for papaya, cranberries, pear, pineapple, cherries, mango, and citrus fruits. Eat more green vegetables such as artichoke, Brussels sprouts, broccoli, kale, cauliflower, and spinach. These foods are not only better for your overall health, but they offer plenty of vitamins (like vitamin A) which enhance sinus health. It is a common belief that eating spicy foods (like wasabi, horseradish, etc) will be helpful in clearing up sinus problems. While this can certainly help thin out the mucous within your sinuses, it’s also likely to give you a runny nose and only provide temporary relief. If you suffer from other issues such as heartburn or acid reflux, spicy foods aren’t going to help you – in fact, they can make the problem worse. Regurgitated acid can work its way up from your throat and into your sinuses and cause some seriously bad problems for you. Both alcohol and smoking should be avoided during a sinus flare-up as they irritate the respiratory tract and worsen nasal inflammation. Also, sinus congestion is often worse with lack of quality rest so be sure to get plenty of sleep and keep your stress level low. Each person’s body reacts to food differently. If you need some help planning a diet with the best food for sinuses that will keep your sinuses clear, give our office a call.